The Valve Screamer™ Whole House Kit is a wireless water alarm and motorized valve system that protects your entire home or business from plumbing leaks. 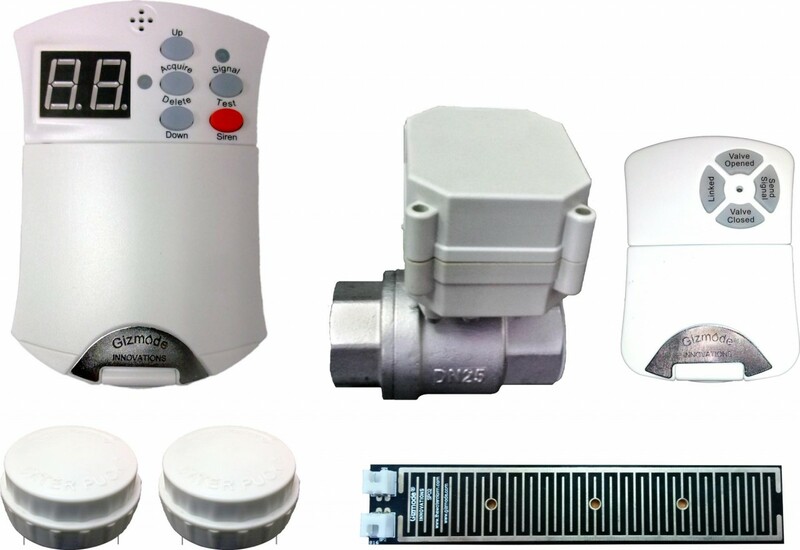 It consists of one Flood Screamer ® central control unit, two Water Puck ® moisture sensors, a sensor pad and a motorized ball valve. It is the easiest wireless water alarm system to use on the market and can be set up in minutes. In the presence of moisture, an appropriately placed Water Puck® will send a wireless signal to the Flood Screamer ® central control unit which will then alert you to a problem by sounding its 130 dB siren while the LED display indicates which zone the event occurred in so it can be easily located. Simultaneously a signal is forwarded to the motorized ball valve and the water is turned off at the main line stopping the leak before major damage is done. Simple three step programming makes linking sensors a breeze. There are no dip switches or cryptic codes to enter. Easy-to-read two digit LED display makes it easy to indentify which sensor has been activated. Click the button below to add the The Valve Screamer Wireless Whole House Kit (3/4 inch) to your wish list.